Greeks around the country have been left angered after hearing news of 90-year-old grandmother Susana Eliadiou being taken to the police station and held there for 12 hours after selling slippers at the Ampelokipoi street markets in Thessaloniki without a license. “The police came and said “pick them up, pick them up,” and my mother thought they were telling her to pick them up and go home, but they said, no, come with us,” said the daughter of the 90-year-old lady, whose mother was arrested and spent 12 hours at the police station for selling knitted slippers. “My mother takes care of her rent, her other children are in Russia. I am a single parent with two children, unemployed from January and my father is helpless at home. He comes out and sells tricycles, stands next to the rubbish bins, to earn 2-3 euros and gets us bread to eat,” said Judy Iliadou. 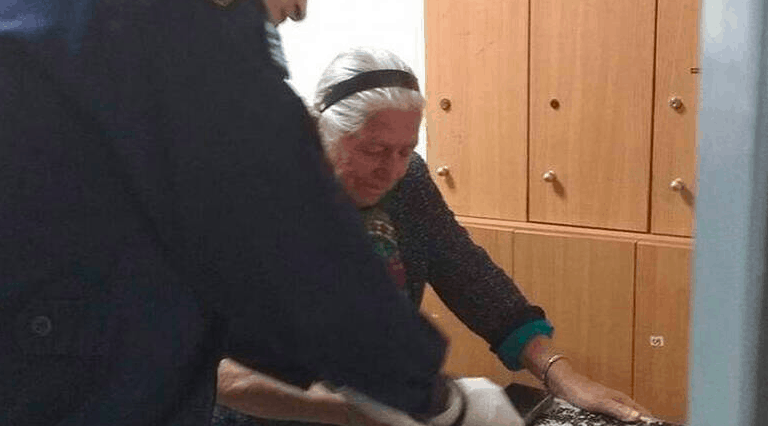 In the 12 hours, while being held in police custody, 90-year-old Susana only asked for some water and a policeman brought her a bottle. As her daughter explained to reporters, neither herself nor her mother is holding a grudge towards the police officers, saying they simply “did their job”. Their only complaint is that they kept the grandmother at the police station for so many hours despite her age. “My parents worked so hard their entire life, we are Greek Orthodox, and we are very proud to be Greek. I have nothing to say about the police, but she was a 90-year-old,” added Judy.